during the NASCAR Camping World Truck Series Ford EcoBoost 200 at Homestead-Miami Speedway on November 16, 2018 in Homestead, Florida. Brett Moffitt led a race-high 59 laps on his way to a sixth NASCAR Camping World Truck Series win of the 2018 season Friday night in the Ford EcoBoost 200 at Homestead-Miami Speedway, the season-finale. 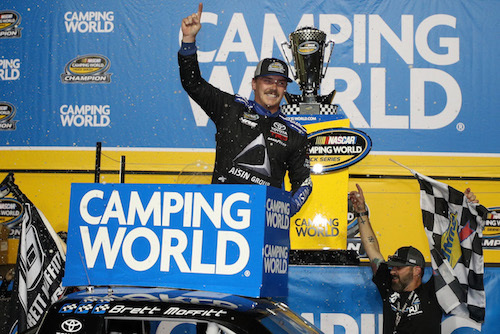 With the win, Moffitt also claimed the 2018 Camping World Truck Series championship, the first for both himself and Hattori Racing. The win also was a second-straight for Moffitt, as he won a week earlier at ISM Raceway near Phoenix. Pole sitter Grant Enfinger finished second. Noah Gragson was Moffitt’s closest title contender in third. The other two championship contenders, GMS Racing teammates Justin Haley and Johnny Sauter, finished eighth and 12th, respectively. Enfinger and Gragson were the only two drivers other than Moffitt to lead a double-digit number of laps, leading 33 and 34 laps, respectively. Enfinger won the first 30-lap stage, starting on the pole and leading the first 33 laps. Moffit was up front at the end of the second stage on lap 60 after taking the lead on lap 40. During the 74-lap third and final stage, Moffitt and Gragson battled closely for the lead. Gragson took the lead early in the stage on lap 67. After several laps of mostly side-by-side racing for the two championship candidates, Moffitt retook the lead on lap 99. After a green-flag cycle of stops completed on lap 106, Moffit was back up front and maintained his lead for the remainder of the race. 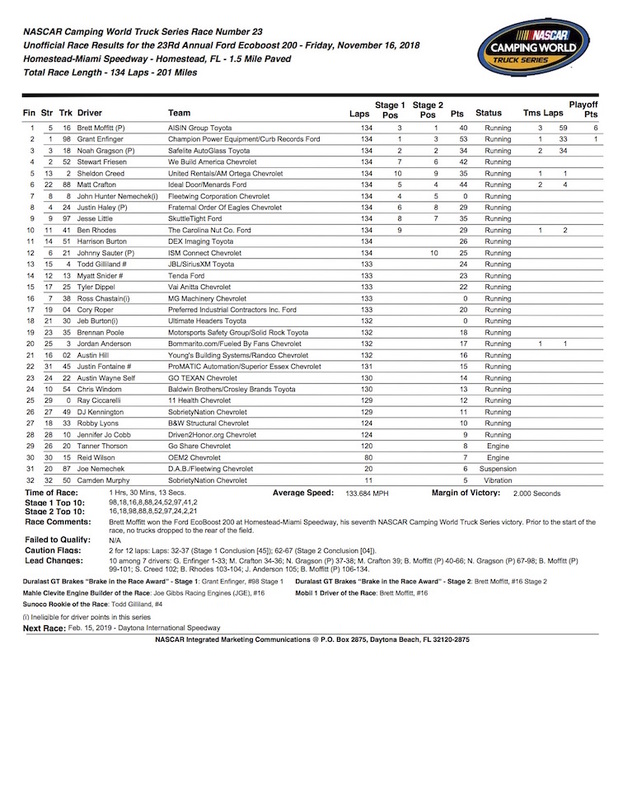 Other top-10 race finishers included Stewart Friesen in fourth, Sheldon Creed in fifth, Matt Crafton sixth, John Hunter Nemechek in seventh, Justin Haley eighth, Jesse Little in ninth and Ben Rhodes in 10th. After finishing 14th, Myatt Snider was named the 20128 NASCAR Camping World Truck Series Rookie of the Year.